The meeting was held on Thursday, October 16, 2014 at the Textile Center at 7 PM. Below is a summary of the meeting. Steve Pauling, the Bobbin Doctor, gave a fascinating and extremely informative presentation on the history of sewing machines. Steve covered a wide range of topics including the very first machine types, the mechanics of making a stitch, needle types, bobbin systems, and the rise and fall of various sewing machine companies. We all learned quite a bit from Steve's wealth of knowledge on the topic. 1) Next Meeting--Thursday, November 20, 2014 7 PM Textile Center. Sue Heinz, of Kismet Quilting will give a demonstration on using Elmer's Glue for accurate piecing. 2) December Social-- The December 18th meeting is the annual Holiday Social. We will have a potluck and a secret santa fabric swap. Those who participate in the optional secret santa swap will fill out a form with some basic questions about fabric likes, needs, and wants that will be shared with his/her santa to help pick out just the right fabric. The amount of fabric to be gifted is approximately 1 yard of fabric in any combination of cuts. Sign-ups for the secret santa swap will be sent via email after the November meeting. 3) January Meeting-- The January meeting will feature nominations for the Board of Directors. If you are interested in serving and have questions, feel free to contact an existing board member. It's a great opportunity to get more involved with the Guild. Elections will occur at the February meeting and the new Board term starts in March. We will also have the mystery quilt to reveal for those who participated. 4) Retreat-- The fall out-of-town retreat will be held on November 21-23 (Friday-Sunday) near Amery WI $135 for members, $145 for non-members. We have the large building. Sign-up sheets were available at the meeting and an online form is available here. See the Retreats page for more information and photos of the site. The retreat is now open to other guilds, so space may fill up fast. 5) Get Inspired Challenge-- The spring challenge, "Get Inspired" was announced. The challenge is to quilt or sew an item that is inspired by something else. 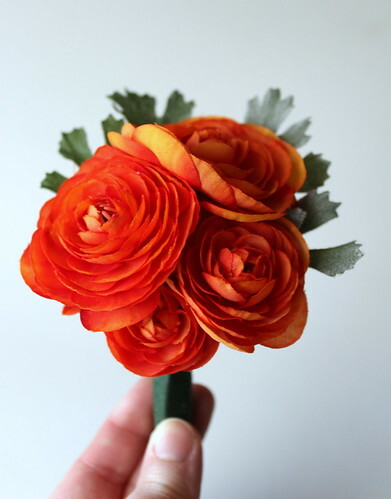 The reveal will be at the April meeting and participants should bring in their finished project with the original source of inspiration (or photo of). No other rules, or restrictions. 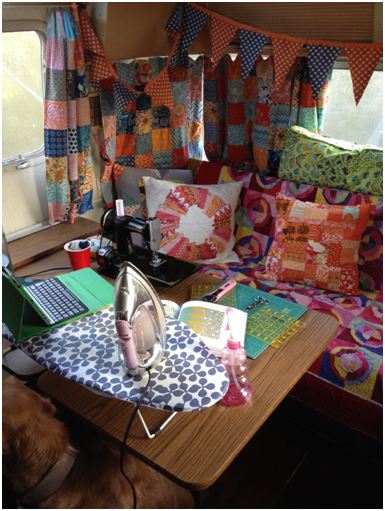 6) Blog Series-- The "show us your space" series has been popular and we are continuing it for those who still want to write about their sewing spaces. We will also start a new Saturday Series featuring holiday gift ideas. 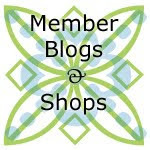 We are always looking for volunteer bloggers--no experience necessary! If you didn't sign up at the meeting for a post, you can email the board anytime to request a slot: minneapolismqg [at] gmail [dot] com. 7) 2015 Quilting Bees-- For 2015 we are going to try and set up a few Minneapolis Modern Quilt Guild Bees. Each "hive" will ideally have 12 members and participants agree to make 1 or 2 blocks for each month (to be determined by each hive). Each participant will have 1 month to be "queen bee". The queen selects the blocks/pattern and collects the blocks for that month to keep for herself/himself in the end. Those who sign up for this need to be committed to participating each month and bringing their completed blocks to the meeting (or mailing them in if attendance isn't possible). In order to keep the level of difficulty appropriate for members with a range of experience levels, a sign-up list for a "beginner" and "advanced" group was sent around. The sign-up sheet will be available at the December meeting, or you can email the board if interested in participating. The bees will start in January. Hi! Vanessa here from Punkin Patterns. We have a fun, new way to welcome and identify visitors at our monthly meetings. 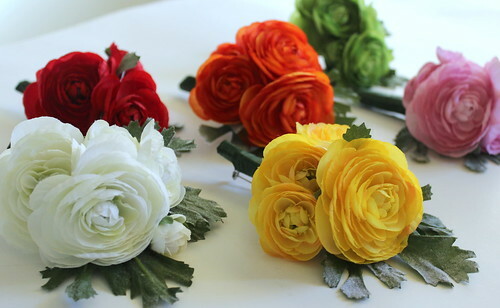 These colorful corsages will be loaned to visitors at our monthly meetings so we can spot them in the crowd. 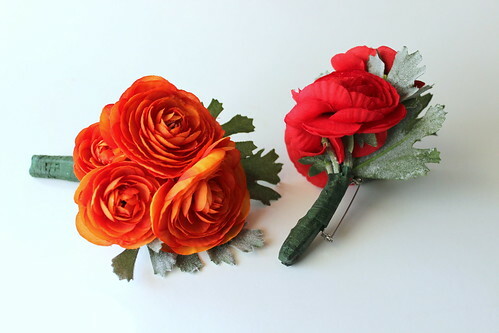 If you see someone at the next meeting wearing one of these pretty corsages, walk up and introduce yourself and say "hello" and make them feel right at home. Hi! This is Carrie, and I wanted to kick off our next Saturday Series - holiday gifts - with a round-up of bags and totes that you could use as holiday gift baskets. First up is the divided basket by Noodlehead, which I know a lot of MMQG members made this past weekend at the workshop. Mine is filled with diaper supplies, not very Christmas-y. But I think the divided basket would make a great "movie night" gift, filled with popcorn, a couple boxes of candy and some DVDs or a gift subscription to Netflix. Or as a hostess gift with some jams or jellies and crackers. 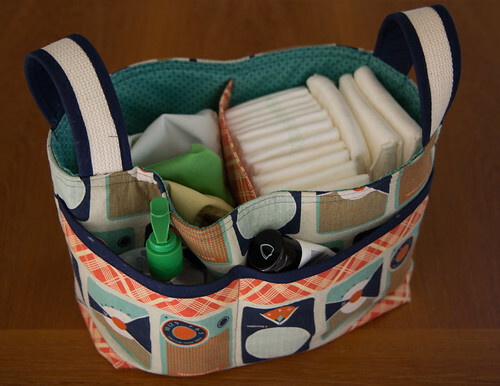 Another pattern with gift basket potential is the Sew Together Bag by SewDemented. Here's one of Kristin's Sew Together Bags. I think these bags would be great filled with art supplies, LEGOs or other small toys for kiddos. Or make one for a quilty friend, filled with sewing supplies. Other possibilities are the Snappy Mani Pouch on the Robert Kaufman site, or the Lined Drawstring Bag by In Color Order. What are your plans for holiday gifts? Series: Show us your space! 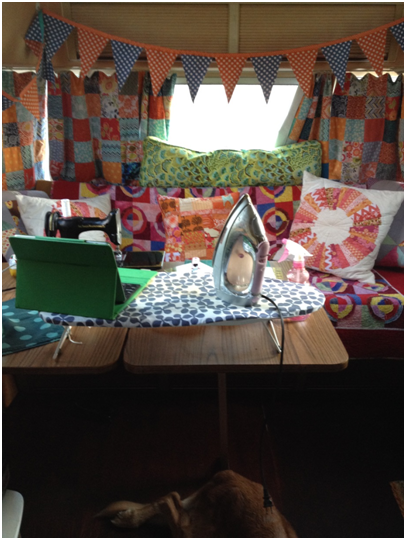 Nikol here from Sewtropolis here to show you my sewing space. Sadly my sewing space at home is a dark basement with lighting from pull string lights only. I’ve moved things upstairs after the second time water got into my basement. 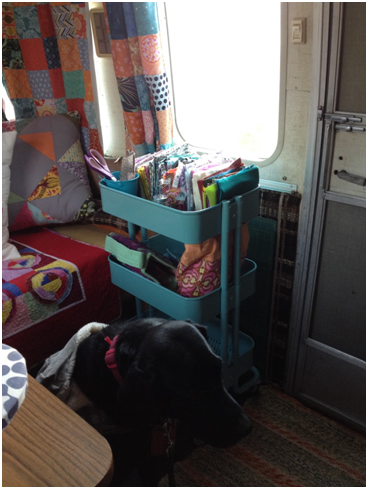 Last summer I bought a travel trailer and ‘Glamped” her up and now I really enjoyed sewing in “Athena” while traveling/Glamping. When I sew at night I turn on the overhead light as well as smaller spot lights that are in the cabinet above the couch. I also have a small table lamp that I’ll bring out when I need it. Though, if I’m plugged into a 20 amp site things tend to get sluggish if I have too many things going at once. The 30 amp sites work much better. If I’m ‘Boondocking’ (at a sight with no amenities) I’ll take out my knitting – which I usually have with me. This summer I’ve done a LOT of sewing for Athena. She has new curtains on all the windows, new seat covers for the cushions in the back (bed), bunting and lots of pillows. 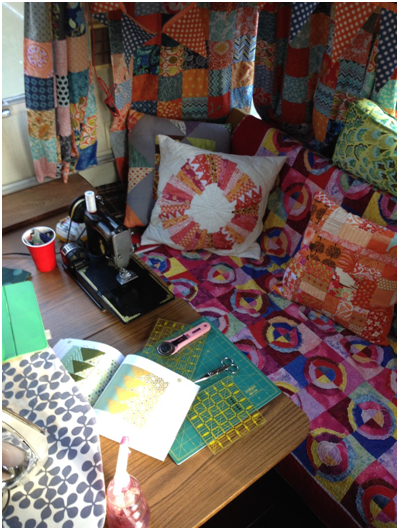 When I sew, I love being surrounded by all the creativity. To me – it’s so pretty and inspiring. I usually leave my Featherweight, iron, ironing board and plenty of projects and tools in the trailer the whole summer long. That way I don’t inadvertently forget something at home. 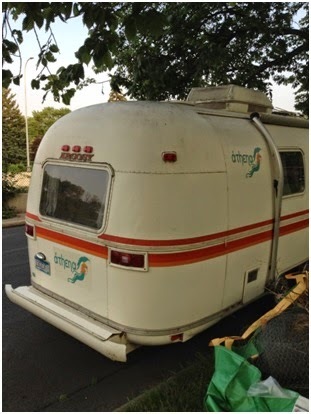 Nothing worse than breaking a needle and not having a spare, while Glamping. I typically work on quilt blocks when I’m traveling since I don’t have a large design board or for that matter a large sewing table. Though I suppose if I had to I could use a picnic table (or two) to lay out a quilt. This past summer I worked on blocks from the Tula Pink City Sampler book. Next summer my plan is to work on blocks from the Farmer’s Wife Quilt. I recently purchased the aqua rolling cart from Ikea – I love the way it ‘goes’ with my trailer and it’s a lot more handy to move around compared to the vintage suitcase I was using. I used to have to put the suitcase next to me on the couch – and every time I got up I’d have to move the suitcase. With the cart I just roll it back under the window. When I’m traveling (on the road) the sewing machine sits in a cupboard on the floor, the ironing board goes on a hook and the iron sits up in a cabinet along and everything else fits on the cart. I discovered with the last trip that even though I surrounded the cart with items to keep it from rolling while I’m driving down the road…. It still rolled around. So, between now and next March I’ll need to figure out a better idea to keep it in place. I’d love to hear your ideas. Hi! It's Carrie, the coordinator of the Marketplace India quilt project. I wanted to say a big THANK YOU to everyone who turned in their blocks - they are beautiful! And despite peoples' worries that their blocks may not be perfect, they were in fact all the same size and piecing the quilt top was easy. I'm so pleased with how this turned out! There were a few leftover blocks, as expected. 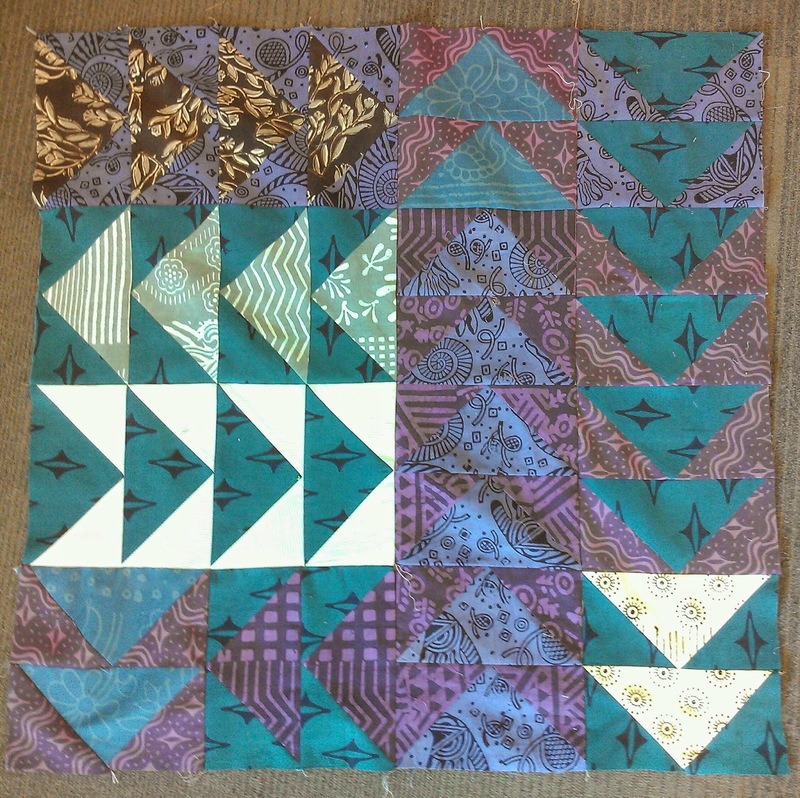 I had originally planned to put them on the back of the twin-size quilt, but there were just the right amount of coordinating blocks to make a 32x32" baby quilt, so I did that instead. I'll be quilting the baby quilt and Chris has very kindly volunteered to quilt the twin-size quilt. Both of them will be sent off to Marketplace India once they're finished. Again, thank you to all the guild members who participated in this project! 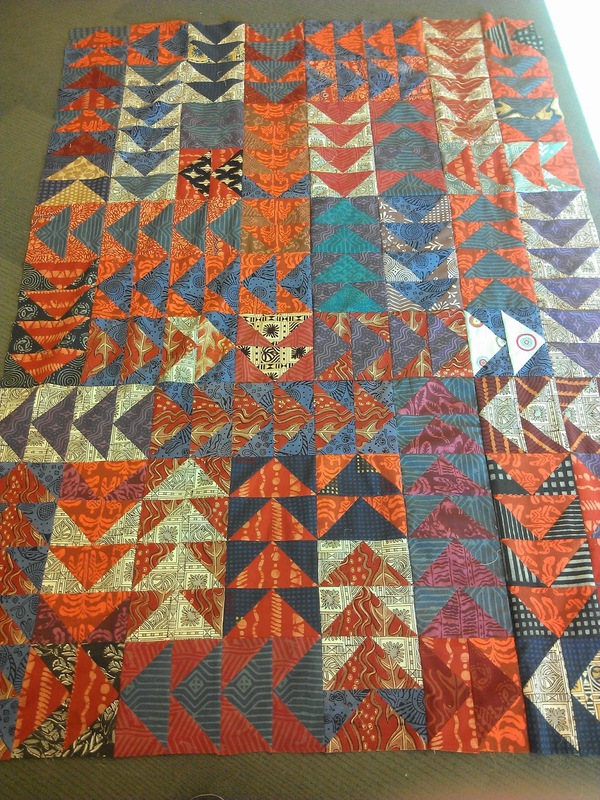 I'll post pictures of the finished quilts before we send them off for auction. We still have a few spots open in the divided basket workshop on Oct 18 with Anna Graham of Noodlehead. We are now opening up registration to non-MMQG members. $45 (if you require the pattern) / $40 (if you already own the pattern). Note: Non-members can use the $10 difference toward a new MMQG membership if it is applied to by or at the December meeting. Please sign up using the form here. Note that payment must be received by Oct 15th to reserve your spot. We're continuing the "show us your space" Saturday series into October Wednesdays. Today's post is from Michelle. I lost my sewing room in my last move. Sigh. But there are several things I like about my new space and I have found workarounds for most of what I lost. I sew and cut on a metal table from Ikea – I love the metal because it is very sturdy and doesn’t scratch. My cutting mat is to the left of my machine. I do a lot of paper piecing and love having my cutting mat so close. When I need more room, I move it over to the kitchen table. Behind my chair is a small, mobile ‘ironing board’ I made from a tv tray from Target. This is great for paper piecing (sew, turn, iron, sew, turn, iron) and I love having it at retreats. Light, easy to fold up and it fits under a standard height table. It is much more convenient than getting up and walking across the room for every piece added to a block. My real ironing board gets folded away when not in use, so this small one gets used a lot. To the right of the table is my fabric stash, sorted by color. I got this rolling metal basket system from Ikea and love it. I can remove an entire basket to paw through and easily keep everything away from my (fabric-loving) cat while seeing what I have. It is also incredibly easy to put everything away when I get home from a shopping trip. But where does all the rest of it go? I commandeered this large hall closet and this is where my ongoing projects, bookshelf, scraps and extra tools (and batting!) live. The wooden storage unit with the plastic trays is also from Ikea and this is great for ongoing projects, like Blocks of the Month and fabric that was purchased for a specific pattern. Each project gets a tray and, when I am done working on it for a bit, I dump all the pieces, special tools, the pattern and the completed blocks into the tray and put it away. Works well. Oh, and when I have all the trays filled, I make myself finish something. Also works well. My favorite thing about my space now is all the natural light and air from the large sliding door. I also like being able to focus on one or two projects – a necessity because there isn’t room to leave everything out. I also keep the area cleaner than I normally would because it is in the living room and am more mindful about my stash – both what I use and what I add. Overall, it works for me.